I experienced kefi before I even knew it was a word. Kefi accurately captures Greek culture as I’ve experienced it. The word roughly translates to: the spirit of joy, passion, euphoria, enthusiasm, exuberance, frenzy. It’s that overpowering emotion you have when you completely let go in the moment, release inhibitions, and allow yourself to joyfully feel the life pulsing through your body and soul. My first true encounter with Kefi happened during one of my last nights visiting a small Greek island off the coast of Santorini. I was invited by some locals in the village I was staying in to take part in the celebrations of the main restaurant’s seasonal closing. 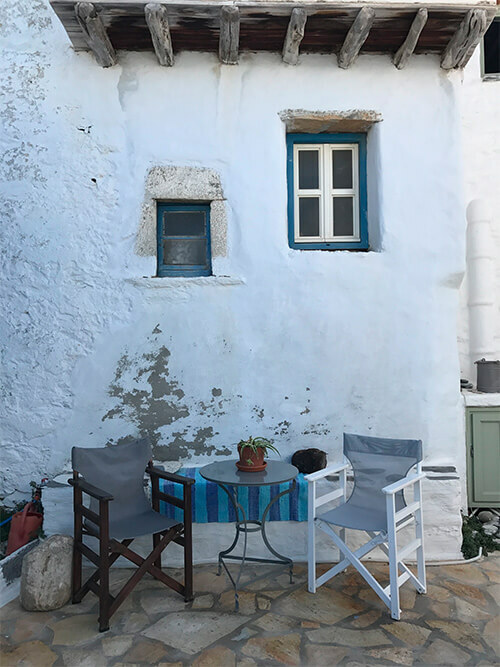 The scene was like something I would have expected from a movie: rows of fold-up tables were set up in the middle of the village’s main square, each crowded with plates and plates of freshly made Greek food. In the midst of 30+ people, I was the only non-Greek. The feast began, and we ate. A lot. Then we drank, and ate some more. As the wine flowed, locals appeared with guitars, violins, flutes, and hand drum. Within a couple of hours, everyone was drunk and dancing to live Greek folk music. The first glass smash was an accident. One of the locals bumped into the feast tables during a dance circle, sending glasses, plates, and utensils flying all over the plaza. As people continued to dance, one of the restaurant’s staff began picking everything up and placing it on a chair. While she was doing that, a dancing man came up and kicked the chair down, sending everything scattering again. I was stunned. Even the owner of the restaurant, who should have cared about his property being kicked around, let himself go in the midst of the feast’s euphoria. Before I knew it, I was getting pulled into the crowd, dancing in a circle like a lunatic to traditional folklore music I didn’t even know. The joy was infectious. In that moment, when I was moving and laughing in tandem with a bunch of Greeks who were taking turns spinning me around, I stopped thinking. I just felt it: the sounds of music weaving with the clash of glasses being thrown against cobblestone, the synchronicity of sweaty, euphoric people in movement, the flow of a universe suspended in time. After I left the dance circle, out of breath from participating in the spectacle, one of the locals came to sit next to me. “So, how did that feel?” He asked playfully. Speechless from the magic of the moment, all I could do was laugh. He put a hand on my shoulder. When I returned from the island and told my Greek friend this story, she laughed and said: “Ah, it looks like you’ve experienced kefi.” I asked her to explain what she meant. It’s important to note that kefi is not exclusive to celebration. It is a positive feeling we can incorporate into our lives every day, even when things are not going our way. Kefi asks us to tap into our spirit, our appetite for life, and create bliss and excitement in everything that we do. It is about living in the moment. Having gratitude for what we have. Connecting with fellow humans in a way much more profound than words. It’s dancing when the music begins to play, when it rains, even when nobody’s watching. The Greek man’s words summarizing the dance I partook in rang profoundly in my soul. The richest experiences in our lives are the one we feel firsthand, rather than trying to understand by reading about them or watching as a bystander. A lesson learned: no amount of thinking or analyzing can explain the meaning of creating such joy in our lives. Only when we allow ourselves to put that joy into practice and feel our soul explode from the emotion, will we really understand why it’s worth incorporating kefi into our lives. What a joy it is to feel. I might add that kefi is not merely a personal feeling of euphoria. At its best, it is a collective feeling that everyone recognizes and participates in creating. from Dance and the Body Politic in Northern Greece by Jane K. Cowan.